Ruth Padel is one of my favorite poets, so I jumped at the chance to read her new book-length holiday poem. Set across one Christmas Eve and Christmas day and narrated by Charoum, the Angel of Silence, the poem switches between Holly, a seven-year-old girl excited for Christmas, and Robin, a forty-four-year-old homeless man who follows a fox to a Crisis Centre. Here he gets a hot meal and some human kindness to make up for the usual bleakness of the holidays:Christmas is the salt mine.Salt in the wound, a nothing-time.I was loved once. Who by? Can’t remember.I especially liked the fragments that juxtapose this contemporary London story with centuries of history:Up here the evening glides over golden mosson the flat-top tomb of Mary WollstonecraftPagan Christmas fizzes and teems with ghosts,midwinter fires, mummers and waites, Yulelogs and mistletoe.The poem also journeys to Jerusalem and Rome to survey a whole world of Christmas traditions, then and now.It’s a lovely little volume, with the red, black and white theme offset by touches of gold. The illustrations are gorgeous, but the story line disappointed me: starting with the character names, it all felt rather clichéd. Padel has treated urban foxes much more successfully in her collection The Soho Leopard, and apart from a very few instances – like the above quotes – the verse struck me as largely undistinguished, even awkward (like the out-of-place clinical vocabulary in “Love, / and the lack of it, can change the limbic brain”). This means that, for me, this book fails to earn a place as a Christmas classic I’ll reread year after year.My thanks to Cat Mitchell of Random House for the free review copy.Originally published with images on my blog, Bookish Beck. Beautiful, beautiful book. I'm not used to read poetry in English, but I enjoyed it very much. It is a sad book, I won't deny it, but it is so real, so powerful. Lovely stories. 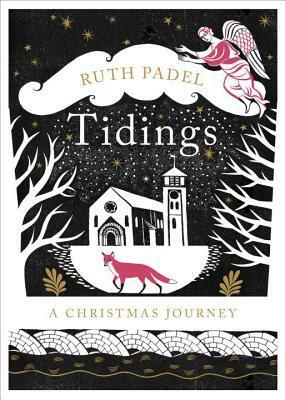 Tidings is such a beautiful poem and so well illustrated that it will become a christmas tradition to read it every year in our home. Lovely little book. A poem about Robin a homeless man, Holly a little girl, a fox and the sunrise sweeping over London and other places. A Christmas poem, spoken by an angel, about a homeless man, a young girl and a fox, set in a snowy corner of London. Unusual and haunting. Wonderful illustrations and a stunning cover by Sarah Young. Ruth Padel - Ruth is a British poet and writer. Her most recent book The Mara Crossing is a mixed-genre meditation on migration, prose and poetry. She has published eight poetry collections, a novel, and eight books of non-fiction, including three on reading poetry. She also presents Radio 4′s Poetry Workshop, visiting poetry groups across the UK to discuss their poems.Her awards include First Prize in the UK National Poetry Competition, a Cholmondeley Award from The Society of Authors, an Arts Council of England Writers’ Award and a British Council Darwin Now Research Award for her novel Where the Serpent Lives.Ruth lives in London and is a Fellow of the Royal Society of Literature, a Member of the Bombay Natural History Society, an Ambassador for New Networks for Nature, a Patron of 21st-Century Tiger and a Council Member of the Zoological Society of London.